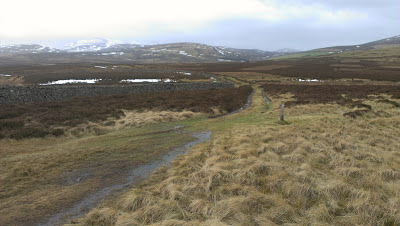 The "other" half of the St. Cuthbert's Way starts in the Cheviot Hills, leaving them behind at Wooler and crossing moors and flood-plains to St. Cuthbert's cave, eventually dropping via woodland and fields to the North Sea and onto the Holy Island (either using the pilgrim's path direct over the sand, or the causeway, depending on tide and will). 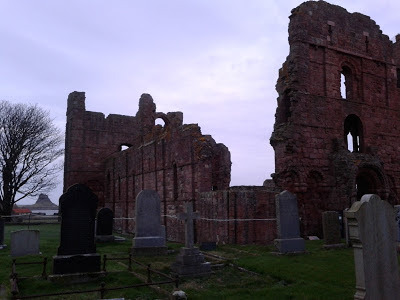 A rare, exotic blog post since most of the second half of St. Cuthbert's Way is abroad in England. Just two and a half hours of jogging over the Cheviots since breakfast, and I was hearing Geordie. Fantastic! We'd enjoyed a good evening at the Border Hotel - nice food, seem to be the place to go around here. Waking up this morning, the wind was battering the window of the B&B and a peek through the curtains revealed an ominous low cloud-base and general darkness across the valley. My dad & I ate our breakfast leisurely, and the hostess did much to help us plan our day ahead, even coming through with her laptop and printing off maps. She'd had a group of guests the week before who'd just finished "the Spine" footrace - i.e. the 268mile length of the Pennine Way. I'm glad there are nutters like that in the world. There was loads of breakfast and I stuffed most of it down, you'd think I'd settled for sitting in front of the telly all day. Turns out it was very mild outside, the strong wind would be mostly side-on, slightly behind, the sun would even make a mid-day appearance and the hat and gloves would come off. That was all fine but I was a bit disappointed that all the snow had been washed away, and I dreaded to think how muddy it was going to be after the thaw... I worried too much - it was all going to be fine, other than the lingering fatigue from yesterday as to be expected, and that feeling of slow progress like yesterday. It's all relative. The plan was to meet back up with ground control a.k.a. dad at Wooler, 13 miles from Kirk Yetholm across the border, have a coffee there, then later in the afternoon try and meet up again somewhere around St. Cuthbert's Cave given there was a car-park and walks in the area for my dad. The tide timetables for the Holy Island causeway looked favourable, it would more likely be daylight that would force a schedule here. There are very few of those National Trail "acorn" signposts in Scotland (we use the thistle up here), but the few of them you'll find are on the stretch of Pennine Way between Kirk Yetholm and the English border. St. Cuthbert's Way joins the Pennine Way for a couple of miles into the Cheviot hills, steep tarmac at first, then onto a good trail up the grassy contours of Green Humbleton. No doubt like everyone else who walks/runs/whatevers the St. Cuthbert's Way, I spent a moment's contemplation at the final "acorn" signpost where St. Cuthbert's pilgrims are routed away from the pedestrian equivalent of the M6 to Manchester. Its actually part of "E2" now I think, prochane arrêt, Nice. I'd never thought of the Cheviot Hills as being so cosmopolitan. Within minutes of leaving the Pennine Way behind, I was at border control - which currently comprises a stone wall on the crest of a ridge, but plenty ancient hill forts around to remind us how rare a moment in history this is to have such laxity! From the border it was downhill towards a forest - that's where you're supposed to go if following the official way, I missed the sign obviously, and accidentally tresspassed along sheep paths to the N side of the Elsdon Burn (a burn, in England?). Realising my mistake I was able to rejoin the correct route after the trees. The route follows a good farmtrack down to a farm, which I guess makes sense, then its tarmac road for a bit, but more like the farmer's driveway than a road, very peaceful and a nice valley setting. This is followed down to the hamlet of Hethpool and the valley of the College Burn. Now here's an area well worth further exploration, it looks like a great approach to climbing the 815m Cheviot - I guess you could come back via the Pennine Way as well. I think this whole area warrants further exploration, and with a bicycle too, lots of empty roads in nice countryside. The St. Cuthbert's Way guide (and OS map) indicate there are medieval cultivated terraces down here on the left, but the impromptu nature of this weekend meant I hadn't had time to read-up and so went ignorantly by, past Hethpool and into forest with feral goats watching me through the trees. It was very wet underfoot along this bit, not much of a path to follow, but it was a nice situation anyway. After threatening to follow a road down off the hills St. Cuthbert's Way suddenly veers right, quite steeply up grassy hillside, eventually onto heather moors behind 361m Yeavering Bell (with its necklace of stones, being another ex-hill-fort). The expanse and relative flatness of this high area reminded me a bit of the North Yorks Moors, although the snowy bulk of the Cheviot gave things away a bit. During the coffee we discussed where to meet next, and agreed we'd stick to the idea of meeting up around St. Cuthbert's Cave. The sun was out and it was warm as I headed down the road, across the busy A697 and a bridge over Wooler Water, where the route heads S through a housing estate before getting back on course for the coast once more, E along a quiet lane towards Weetwood Moor. It was steep uphill, I'd just had a scone, so I was reduced to a walk. The hat and gloves were off - so different from yesterday at this moment. The way leaves the road behind to continue the ascent up onto the moor - up a gouged-out bit of hillside which was quite rough after the road, it was like a natural gutter for the hillside! Washed-up bits of vegetation and lots of sand deposits. Was nice to get over a style and out onto open moor, with views around. The way drops steeply N off Weetwood moor through a bracken-filled nursery of trees, the bracken dead and brown just now but could be interesting in mid-Summer I'd imagine. From up here there was a great view of the impressive Weetwood Bridge. A long stretch of road and farm-track followed, the Cheviots were left behind now but it certainly wasn't flat country, up, down, up, down, zig-zagging towards St. Cuthbert's Cave. The way resorted to fields, some well-and-truly "divotted" by cows, and it was back to mud and a slow pace heading towards the forested hillside of "Cockenheugh" which hosts St. Cuthbert's Cave, and at this moment in time, my dad. We met up along the nice track through the trees heading NNW. My dad was as aware as I was of the race-against-daylight that was going on here, and started jogging along too. Pity I didn't really give the caves a proper visit, but at least my dad got to. Back uphill over the last ridge before the North Sea, heather, then grass, with sheep joining in. My dad had just made the same observation I had a few years ago regarding sheep South of the border.. He asked if I'd noticed how the sheep are different in England, that they don't just get out of the way, and some even run after you? But in Scotland, sheep always run away? Hmm, no further questions your honour. From the high area of Holburn Moss (well that's what its called on the map) I was now looking over the coast, and in spite of the cloud coming back in, Holy Island was clearly visible below. Although the way did make a V-turn away from it to take in Shiellow Wood. The route through the trees was nice, although missing a critical sign at one point where a narrow trail cuts away from the forest road where it approaches a house - I guessed my way onto that trail and followed the muddy route down and out of the trees and back onto field-edges, eventually onto a road downhill into the village of Fenwick (no services) where my dad was parked and waiting. Just over 5 miles to go, most of those on the causeway/island, plenty daylight left, all good! Changed into shorts and ditched the bag and trail shoes so I could pick the pace up a few gears. Felt brilliant to bound over the A1 and along the tarmac beyond which I naively hoped would take me all the way to Lindisfarne. Instead a fingerpost sent me up a mud-ramp which was hard enough standing still on never mind moving forwards), then across a pond (i.e., presently flooded field), then down the side of ploughed fields to cross the East Coast Mainline (very busy - two trains went speeding by in opposite directions as I approached). The causeway was very close from here. My dad was parked before the causeway, and it looked clear of water - the notice said we had until 17:45 to get back across. Game on! Looking from Holy Is. The posts across the sand are the "Pilgrims Path"
Even from the causeway, I could just make out the snowy Cheviot Hill about 30 miles inland over my shoulder. We got into town just before the cafe was closing, so just enough time for a celebratory coffee. Wandering around very briefly, maybe too briefly, we wanted to get back across that sand-dusted and unlit causeway before it got dark! It had been another great weekend, and a nice change from doing jobs around the house.